1) Tomohiro Ishii: The biggest show this week was NJPW's King of Pro Wrestling. While Tomohiro Ishii's match wasn't the main event, he did win the biggest title of the evening. In what was arguably the match of the night, he faced Togi Makabe for the NEVER Openweight Championship. If that match sounds familiar, it's because these two have met multiple times this year, including at Wrestle Kingdom and Dominion. Some of their matches have been lackluster in my eyes, but this one delivered and was up there with the WK9 match as the best they've had together. Ishii won back the title and is now set up to defend it against Tomoaki Honma, who he's only had great matches with. Not only was the win big, but it should hopefully freshen up the division if Ishii gets new opponents. 2) Kazuchika Okada: The main event of King of Pro Wrestling saw Kazuchika Okada defend his IWGP Title. This was against his rival, AJ Styles. It was Styles who took the belt from him in 2014 and Styles that Okada beat for the belt back in July. These two almost always have stellar matches and this was no different. I currently have this as a **** match and it delivered in the main event. It's all a part of a bigger redemption story for Okada. Winning the title from AJ and successfully defending it is something he had to do on the road to his Wrestle Kingdom 10 showdown with Hiroshi Tanahashi, who he should defeat in that main event. It was the first defense since winning the title and looks like it will be his last until WK10, which he made good on. 3) Apollo Crews: In a bit of a surprising move, Apollo Crews won a battle royal in the main event of NXT this week. The winner earned a shot at Finn Balor and the NXT Championship. The crowd badly wanted Tyler Breeze and it seemed like Samoa Joe would win based on the fact that he challenged Finn earlier in the show. However, Breeze was eliminated by Joe and then pulled Joe out himself. That left the match down to Crews and Corbin. I expected Corbin to win since Crews is very new and it would give Finn a heel challenger. Instead, Crews picked up the win and a ton of momentum, despite being in NXT for less than two months. 4) Timothy Thatcher: I realize that the gif I used for this isn't from this past week but it'll have to do for now. I've only recently been able to check out Timothy Thatcher. I saw him in the Battle of Los Angeles and he, along with Biff Busick, was the most impressive guy on those shows. His technical style, mixed with some hard hitting offense is just so enjoyable to watch. This week, he successfully defended his Evolve Championship at Evolve 50 by besting Trevor Lee in what I'm hearing was a very good match. This dude has been making waves in 2015 and should only become a bigger name as time goes on. 5) Jay Lethal: Yes, it's Jay Lethal again. The Ring of Honor World and Television Champion had a solid week. He didn't have a standout match or defend his World Championship, but he did put his Television Title on the line. 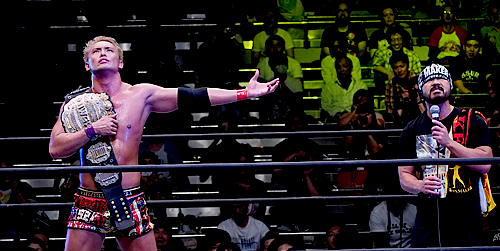 On ROH TV, he faced Watanabe, who earned a title shot by winning a gauntlet match at Field of Honor. The match was solid and Lethal was able to win with the Lethal Injection. Honestly, Watanabe had a case for the fifth spot after making waves by returning to New Japan as Evil and siding with Tetsuya Naito and Los Ingobernables.